The What: Matrox Graphics Inc. has unveiled the Matrox C900, a single-slot, nine-output graphics card that supports nine 1920x1080 displays at 60Hz. The latest card in the popular Matrox C-Series line of multi-monitor graphics cards, C900 will be demonstrated at ISE 2016 (Amsterdam RAI, Feb. 9-12, stand 11-F48). 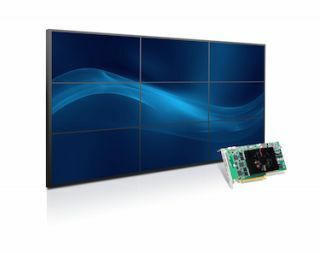 The What Else: A special-purpose graphics card designed to power 3x3 and 9x1 video walls, Matrox C900’s single-slot form factor and low power consumption at 75W offer digital signage and video wall vendors simpler integration and a lower cost of ownership. Its support for stretched desktop across all nine synchronized outputs lets users run any application full screen across a 3x3 video wall which makes the card ideal for signage installations in retail, corporate, entertainment and hospitality environments as well as control room video wall solutions in security, process control and transportation. Matrox PowerDesk desktop management software for Windows is included with C900 to give users a comprehensive set of tools, including bezel management and EDID management, to configure and manage their multi-display setups. Advanced APIs are available to developers and OEMs to build custom interfaces and applications. The Bottom Line: Matrox C900 will be available in Q2 2016. Register at www.matrox.com/c900/notification to be notified of the latest C-Series updates.